One of the reasons I stopped blogging so regularly was because, well, I was running out of things to say. You see, the Slow life is the simple life is the easy life. And, so in my quest to become slower, unflustered, uncomplicated and uncluttered, I often found that I was practicing the same things over and over again, getting a bit better each day. This doesn’t sit too well with the blogging principle, which requires lots of content, regularly. A lot of blogs I have seen on simple living, minimalism and related topics, are ironically complex (and repetitive) and not really simple or minimal at all! I can only assume that is to try and keep up with the current blogging paradigm of regular content, regardless of quality. 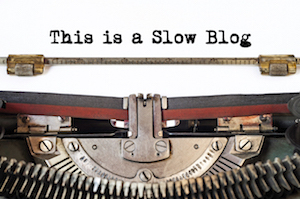 Slow being what it is, if I did a blog every day, or even every week it would soon become repetitive or I would be tempted to over complicate the issue just to give me something to write about. Why? Well I am clutter monkey, I tend towards over-complication if I am left to my own devices (I ALWAYS pack to much when I go on holiday!) and it takes a lot of disciple for me to keep things simple (it was one of the reasons I got involved in the Slow movement in the first place). So in this spirit of simplicity, what are the 3 keys to a slow and happy life? Well, as I said in my previous post (here), I believe that everything comes from cultivating the slow mindset or “tortoise mind”. So these 3 keys are the keys to creating your tortoise mind. Once you cultivate them you will find yourself able to more easily embrace the slow life, the minimalist approach and simple living. This really is the key to slowing down. Life is only happening in the NOW, yet how often do you really pay attention to the present moment? How often are you on autopilot or thinking about what you are doing tonight or tomorrow, or lost in a memory? How often do you get hung up on things, wave the ride of emotion; panic, fear nervousness? Really focus on the food your eat and notice the explosion of flavours your often miss, the texture, the sensation, the emotions and memories it conjures up…. There is an interesting psychological phenomenon called habitation, which basically means if we see, do, or experience the same thing over and over again, we stop paying attention to it. This process is what our modern consumer culture relies on. It makes us acutely aware of what we haven’t got and makes subtle changes to “this years model” to keep us wanting the new and exciting versions. One of the fastest ways to overcome this process is to be consciously grateful for what we have. Every day make a list of at least 10 things you really appreciate in your life, this can be anything from the fact you have a house, to reminding yourself why you bought the car/watch/TV/whatever that your bought (it can be something really simple, basic or seemingly silly, it doesn’t matter, as long as you are grateful for it). Really feel the gratitude. You will find you will become more mindful and crave new things and experiences less and less. The final key to a slow and happy life is to be compassionate to our fellow wo/man. This doesn’t mean being a drip or a push over, it is about recognising that everyone is doing the best with what they have got and making the best decision they can at the time according to the information and criteria they are using (no matter how stupid or annoying, or “wrong” it may seem to you) and that you have done stupid things in your past and will again in the future. You don’t have to become an over emotional lovey, who runs round hugging everyone one, you just need to forgive people. It really is that simple, just forgive them. That will free yourself up of all the stress, anger and rage about things you can do nothing about. Just stop, take a deep breath, say (silently in your own head) “I forgive you” and relax. See how good that makes you feel? Once you have got the hang of forgiving peoples wrongs (or perceived wrongs!) against you, you will find you will become more patient, mindful and often more polite (which is a very good thing). So there we have it, the 3 simple keys to slowing down. If you just practice these 3 keys each day, you will find you will be Slower and happier in no time! PS, I have added a merchandise and recommended reading list to the “Buy Stuff” page, go check it out.